Have you ever seen Sawfly Larvae? 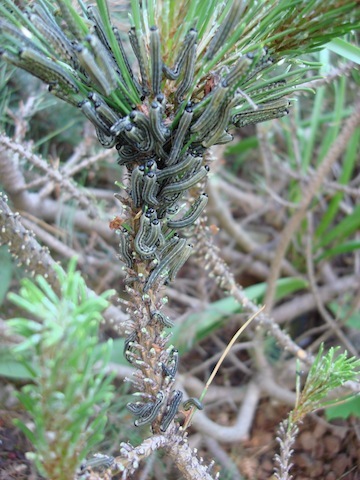 These garden pests that I saw, gathered in a rather sinister bunch up the length of a branch of Mugo Pine needles. At first glance they looked like caterpillars and I was thinking there would be some very fine butterflies when they spun their cocoons…however, they were not caterpillars. They were larvae that would hatch into sawflies which are closely related to wasps, bees and ants, but they do not sting, nor are they flies and they don' t form the same social network that wasps or ants do. My research showed these are most likely the Black-headed Pine Sawfly and they exhibit some very unusual larval behaviour. In unison, these larvae (that look like caterpillars), all raised up at the same time for an instant. It was not a pretty sight, in fact, it was rather eerie. Most species grip the leaf edge, or in this case, needle edge, and wave their bodies in an "S" shape when they are disturbed, but this behaviour does not occur with all the species of the larvae. They can defoliate a plant, (or in this case, a Mugo Pine shrub) in a few days. 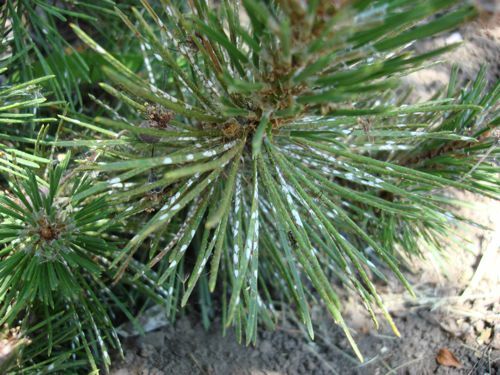 A week later, the few remaining pine needles were covered in small white dots in a straight line up the needles….. eggs - thousands of them. This particular Mugo Pine was destroyed so much that it had to be dug out. There were few needles left, but the thought of many thousands more of these spooky larvae next Spring, left me cold.It was suggested to me that sometimes , a shrub or tree, near the end of its life, sends out a sort of signal to insects that might be an invitation to "come and get me - I have no resistance left". Hmmm - what a thought.However, sometimes it is possible to get rid of these larvae without removing the bush or plant. The easiest, but not the nicest, is to remove them by hand. With a rubber glove on your hand, pull them off and squish them (ugh) but it works. One suggestion is to use a shop vacuum… that would work, but you would still have to find a way to squish them at some point.It has also been shown that Bt (Bacillus thuringiensis) is not effective.